Down and feather are the by-products obtained from slaughtering of duck and goose for consumption. The growth in consumption of duck and goose has led tothe availability of down and feather across the globe. These by-products are processed to meet the demand of various end users. The primary processing of down and feather may vary based on the application of the end product. The global down and feather market is anticipated to expand at a high growth rate during the forecast period from 2018 to 2026. Moreover, growth in consumer preference for natural products, availability of end products at lower price, and rising demand for furnishing products from the residential and commercial sector are a major driving force in the down and feather market. 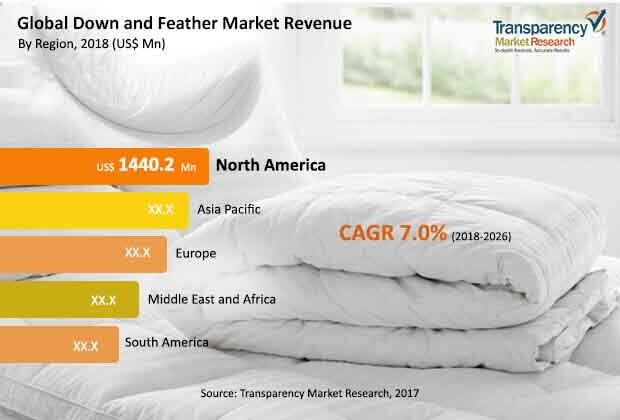 The global down and feather market was valued at US$ 4,549.2 Mn in 2017 and is forecasted to expand at a CAGR of 7.0% from 2018 to 2026. It is estimated to reach a value of US$ 8,236.0 Mn by 2026. Over the last few years, organizations have changed their business models in order to incorporate the changes as per demand and regulations. Large slaughterhouses primarily process down and feather to avoid contamination from blood stains and supplies to industrial end users. Additionally, major down and feather players are involved in the business of primary processing along with manufacturing of products such as pillows, apparels, bedding, and comforters. Down and feather market players profiled in the report include Allied Feather & Down, Bettfedern Handelsgesellschaft mbH & Co. KG (Rohdex), United Feather & Down, Inc, Norfolk Feather Company, Down-Lite International, Inc., Hans Kruchen, Heinrich Häussling GmbH & Co., Feather Industries, KL Down, and Maya Tekstil. The global down and feather market has been segmented on the basis of origin, product type, distribution channel, and geography. According to origin, the down and feather market is segregated into duck and goose. Duck and goose are reared to gain eggs and meat for consumption. Down and feather are by-products obtained from the slaughtering of duck and goose in the abattoir. The global down and feather market by origin is expected to be attractive for duck during the forecast period from 2018 to 2026. In terms of product type, the market is segregated into bedding, comforters, pillows, and apparel. Comforters were the largest segment of the down and feather market in terms of value in 2017. However, the market based on product type is expected to be attractive for pillows and apparel. In terms of value, it is forecasted to expand at a CAGR of 7.2% and 7.1% respectively, during the forecast period from 2018 to 2026. Based on distribution channel, the global down and feather market is classified into online distribution channel and offline distribution channel. The market based on distribution channel is expected to be attractive for the online channel during the forecast period from 2018 to 2026. In terms of geography, the market is segmented into five regions namely North America, Europe, Asia Pacific, Middle East &Africa, and South America. North America led the down and feather market in 2017. However, the market in Asia Pacific is anticipated to grow at a CAGR of 7.5% during the forecast period from 2018 to 2026. The primary drivers of the down and feather market in Asia Pacific are preference for use of natural products, growth in population, and availability of products at lower prices. Additionally, increasing demand from the residential and commercial segment for furnishing is stimulating the down and feather market. However, North America is expected to witness substantial growth rate during the forecast period. Europe seems to have major potential for the down and feather market which is anticipated to increase at a CAGR of 7.0% in terms of value during the forecast period from 2018 to 2026. The down and feather market has been segmented in terms of origin, product type, distribution channel, and geography. Based on origin type, the market has been classified into duck and goose. The global down and feather market based on product type is classified as bedding, comforters, pillows, and apparel. Based on distribution channel, the market is segmented into online distribution channel and offline distribution channel. Further, the offline distribution channel is sub-segmented into specialty stores, hypermarkets, and supermarkets. Geographically, the report classifies the global down and feather market into North America, Europe, Asia Pacific (APAC), Middle East & Africa (MEA), and South America. The regions are analyzed in terms of revenue and volume generation. Furthermore, region wise prominent countries covered in the report include the U.S, Canada, U.K., Germany, Italy, France, China, Japan, India, Australia, GCC countries, South Africa, and Brazil. The report also includes industrial evolution in the down and feather market. We have provided Porter’s Five Forces analysis which identifies bargaining power of suppliers and buyers, threat from new entrants, threat from substitutes, and threat from competition in the down and feather market. Value chain analysis which identifies the key stakeholders in the down and feather market is also covered in the report. Furthermore, policies and regulations aiding the market are also covered. The report covers market attractiveness analysis and market positioning of key players for all regions covered in the scope of the study. Market attractiveness analysis identifies and compares attractiveness of different segments in the market on the basis of CAGR and market share index across North America, Europe, Asia Pacific, Middle East & Africa (MEA), and South America. The report also includes competition landscape which includes competition matrix and market share analysis of major players in the global down and feather market based on their 2017 revenues. Competition matrix benchmarks leading players on the basis of their capabilities and potential to grow. Factors like market positioning, product offerings, and R&D focus are attributed to a company’s capabilities. Factors including top line growth, market share, segment growth, infrastructure facilities, and future outlook are attributed to a company’s potential to grow. Company profiling includes company overview, major business strategies adopted, and market revenues for the years 2015 to 2017. The leading players operating in the market, manufacturing a wide range of down and feather products include Allied Feather & Down, Bettfedern Handelsgesellschaft mbH & Co. KG (Rohdex), United Feather & Down, Inc, Norfolk Feather Company, Down-Lite International, Inc., Hans Kruchen, Heinrich Häussling GmbH & Co., Feather Industries, KL Down, and Maya Tekstil.